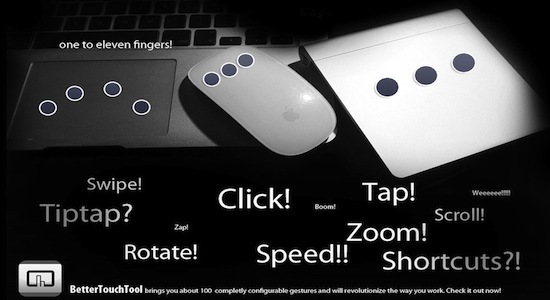 Following a recent post about using Apple’s Magic Trackpad as a num pad, I did some more research and found a couple of friends of the site Ceri Thomas and Tamas Dragon use an application called BetterTouchTool with a Magic Trackpad as an alternative man/computer interface. for those of us using a computer all day every day RSI can be an issue so finding alternatives to the mouse and keyboard even for some functions can help to stave off RSI. Tamas has written extensively on his blog about this and you can pick up his experiences and wisdom from there including a video. This workflow is definitely not for everyone, it takes some time to establish what will and what won’t work and you’ll find things that don’t work consistently. One such command was the Single Tap Middle Bottom that I’d set to be the select tool (F7) wasn’t triggering on my laptop trackpad consistently so I duplicated it with Single Tap Middle Top which smoothes my interaction. Thank you very much Ceri for sharing this with the Pro Tools Expert community.